by spreading love and joy, showcasing their culture in an open air performance at Chowrastha. Julio Martin, a pianist and an accomplished jazz artist from Buenos Aires love for the Hills has made him stay back with his wife Noemi Troconso. If that is not enough, he also invited eleven of his friends from Buenos Aires to come to Darjeeling for Christmas, who gladly accepted the invitation and are here. Kolkata and Mumbai and came to Darjeeling last year. “For me it is the sharing of love of music. Our message is simply love, unity of family and reconciliation,” he said. The Argentinean admitted that the group’s performance and aim to foster brotherhood did not have the official stamp of his Government. “Our performance is not official. But, it is also true that my Government is interested to build a relation with India. I did speak to our country’s Ambassador and he is happy with the initiative. Based on the response we get, our Ambassador could visit Darjeeling next year, as we plan to continue this program with more artists from Argentina,” said Martin. For Yesica in her early twenties, the chance to visit Darjeeling a second time was irresistible. 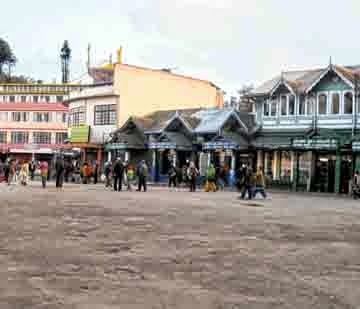 “This is my second visit to Darjeeling as I was here with some friends in 2010. When I was invited by Martin I gladly accepted it and am happy with my decision,” said the law student and an accomplished musician. Similarly, Constan Za, an acrobat too was overwhelmed by people’s response. “The people have flocked to see our performance throughout the two days that we have been performing. People here are well aware of music and dance which reflect in their acceptance,” who awed the crowd today with her aerial acrobatics without a safety harness.